This moderation in food inflation now being seen for consumers, though, is price deflation for farmers. And it is a generalised fall across agricultural commodities, a phenomenon that defies easy explanation. On February 7, the Reserve Bank of India’s Monetary Policy Committee (MPC) projected the annual consumer price index (CPI) inflation for the January-March quarter at 5.1% and “in the range of 5.1-5.6%” for the first half (April-September) of 2018-19. But in its latest policy statement on April 5, these projections have been revised downwards to 4.5% and 4.7-5.1%, respectively. The lowering comes despite no let-up in global oil prices — Brent Crude futures for June closed at $ 71.04 per barrel on Tuesday, the highest since December 1, 2014, while diesel is retailing now in Delhi at a record Rs 64.96 a litre — and improved realisations on key manufactured goods, including steel and cement, on the back of corporate consolidation and a gradual demand recovery. The only factor influencing the MPC’s benign outlook for inflation is food prices. Food and non-alcoholic beverages have a 45.86 per cent weight in the combined CPI. At 3.38%, the retail food and beverage inflation for February trailed the corresponding 4.44% year-on-year rise in the overall CPI. But what makes the “sharp moderation in food prices” (to quote from the MPC statement) unique is its being spread virtually across all crops. 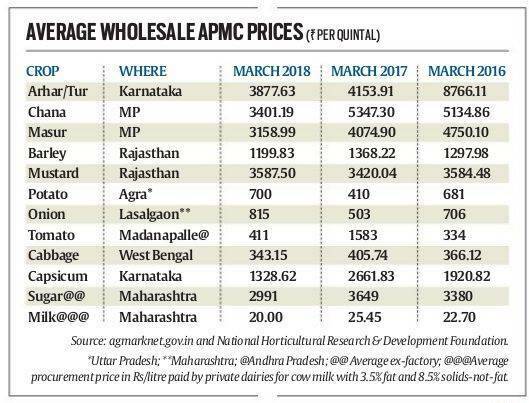 The accompanying table compares average wholesale APMC (agriculture produce market committee) mandi prices for major crops sold in March to their same month levels of 2017 and 2016. In arhar/tur (pigeon pea), chana (chickpea), masur (lentil) and barley, not only were the rates lower than a year and two years ago, but also well below their corresponding minimum support prices (MSP) of Rs 5,450, Rs 4,400, Rs 4,250 and Rs 1,410 per quintal, respectively. While mustard prices are at more or less their previous years’ levels, they are nowhere near the government’s MSP of Rs 4,000 per quintal for the just-marketed 2017-18 rabi crop. However, it isn’t pulses and oilseeds alone. The same trend holds for sugar, milk and vegetables such as tomatoes, capsicum and cabbage. Potato and onion prices seem higher than last year, but they are hardly at levels that can be called remunerative. The current all-India modal average retail price for tomatoes is Rs 10 per kg, Rs 15/kg for potatoes and Rs 20/kg for onions. That makes it the second successive summer when all the three staples are simultaneously retailing at Rs 20 or lower. While last year’s price crash during the rabi marketing season was attributable to demonetisation and the consequent liquidity crunch in produce markets, can its effects continue to linger even when cash has ostensibly returned to the system? Or, is it that demonetisation, in combination with the goods and services tax, has made traders “afraid”? Anecdotal evidence suggests that the Rs 2-lakh daily limit on cash transactions and the fear of being “watched” by revenue authorities has made traders less inclined to buying and stocking up produce during the harvesting season, with a view to profit from price increases. Whether this is what’s, indeed, happening in APMCs and making farm prices more prone to fall than to rise is, however, hard to establish. But farmers not getting even existing MSPs, leave alone rates that are supposed to give them 50% return over comprehensively defined production costs, is not great news for any ruling party when elections aren’t too far away.